Drift Atlanta returns to Michelin Raceway Road Atlanta May 10-11, 2019. Your senses will be in overdrive as speed and car control meld into a dramatic competition that tests driver and car to the absolute limit. With equally exciting off track entertainment and displays, Drift Atlanta has become the epicenter of car culture in Georgia. 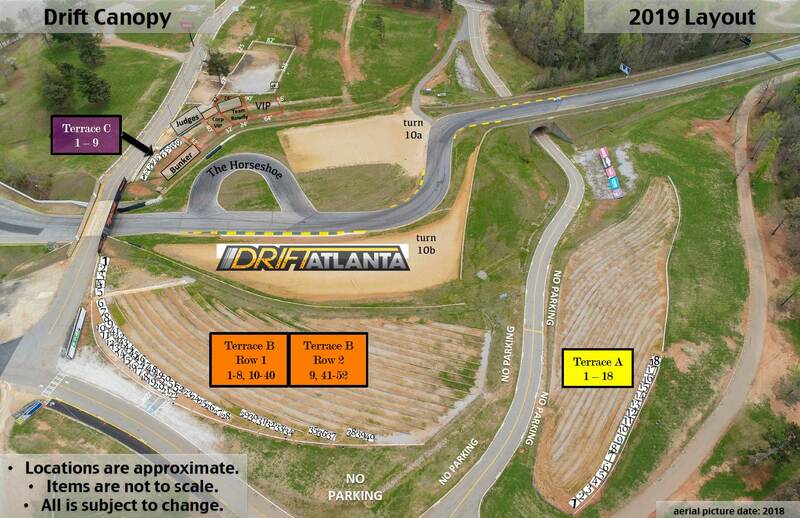 The Formula Drift® competition at Michelin Raceway Road Atlanta will be conducted in the Turn 10 complex, a right left-right-hand combination that will require the drifting competitors to quickly change direction while in full drift mode. A panel of professional drifting drivers will determine the bracket winners. Visit www.formulad.com for more information about the Formula Drift series. The Global Time Attack represents the ultimate expression of automotive technology. This innovative racing series is quickly taking the motorsport world by storm, testing the drivers, teams and cars to their limits on a wide variety of dedicated race circuits with the singular goal of setting record lap times. We set the stage for the fastest timed laps in racing where drivers compete against the clock, allowing teams to focus solely on achieving the fastest lap times against other drivers and machines on a given circuit. Global Time Attack teams can showcase their fabrication, tuning and set-up skills in order to create the fastest car possible. Global Time Attack car classes include Unlimited, Limited, Street, and Enthusiast determined by the amount of allowable modifications and separated by drivetrain configuration All Wheel Drive, Rear Wheel Drive and Front Wheel Drive. NOTE: Due to Hall county ordinance, no alcoholic beverages may be brought into the facility. All vehicles subject to search. In Japan, the art of Drifting has been popular among the street racers or "hashiriya" for more than 15 years, and has morphed into one of the country's number one attended motorsports in less than a decade, where professional Japanese Drifters are the equivalent of national celebrities. The FORMULA DRIFT Championship consists of a scheduled number of two-day meets or Championship “Rounds” in which drivers compete in a single elimination bracket of “head-to-head” match-ups. Judging is done via a 3 personal judging panel. There are two parts to each competition. First is the single car qualifying runs. Then it is the two car head-to-head battles. Drift Atlanta Reserved Canopy Space Now On Sale for 2019! Call 800.849.7223 and ask for Ara to get on the waiting list for 2020!